From Japan where this heart shaped form is traditionally used for beating futons, but actually produced in Indonesia source of most of the World’s raw rattan. 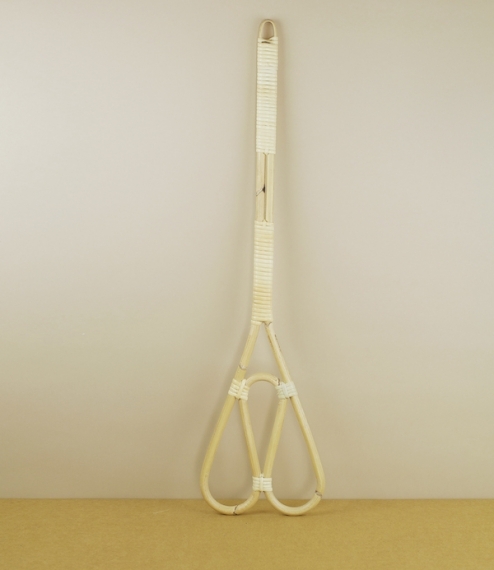 A smaller beater bent from a single cane which is bound rather than woven as is the case with our other beaters. Obviously good for beating futons, but also lighter rugs, moveable carpets, and especially natural woollen blankets - items which can be difficult to vacuum, too delicate to wash, and perhaps reluctant to be dry cleaned. About 65cm long, and 16cm across the head.